I’m quite aware that not everyone has my sweet potato obsession. ‘Not sweet potatoes again” is a phrase often muttered by members of my family. What’s not to like about a healthy food that’s naturally sweet? I just don’t get it. Especially considering how much pumpkin love there is. I find that sweet potatoes can be used in any recipe pumpkins can be used in, plus a whole lot more. They are more accessible than pumpkin during the non-fall months and they are easier to prepare. OK maybe not easier than canned pumpkin. But still. Sweet potatoes are so versatile. They can be eaten plain, or in a variety of sweet and savory recipes. My personal trainer, who is perhaps the healthiest eater I’ve ever met, eats a sweet potato just about everyday. Totally plain. Just pops it in the microwave until it’s cooked, picks it up, in his hand, and starts chomping away at it. Not utensils needed, no salt or butter. Just the sweet potato. Wish I enjoyed eating food that plain. My favorite sweet potato recipes are always savory. 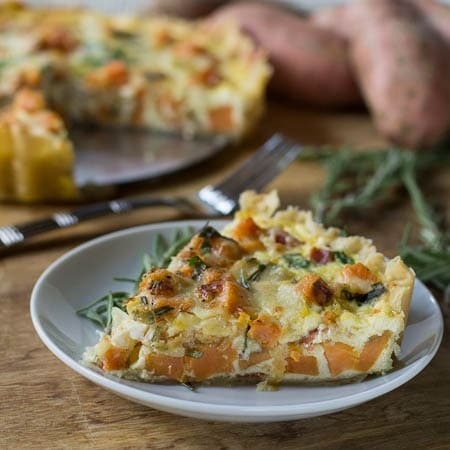 When I saw a recipe for Sweet Potato and Onion Tart in the October 2012 Southern Living Magazine, I was very intrigued. A tart (or quiche is a better term for this particular recipe) was one way I had never cooked sweet potato. And let me just tell you, I think Roasted Sweet Potato Quiche might just be my favorite quiche ever. The sweet potatoes, along with some onions are roasted first to heighten their flavors. Some bacon is added which gives a salty contrast to the sweetness of the sweet potato and onion. Plenty of Gruyère cheese is used. Is there any better cheese for quiche? I don’t think so. Fresh parsley and rosemary round out the flavors. Oh how I love rosemary with sweet potatoes. The mixture of sweet potatoes, eggs, and cheese tasted so fabulous I’m thinking that sweet potatoes would be delicious in omelet form too! For more sweet potato cooking inspiration check out my Sweet Potato Pinterest Board. Over 320 sweet potato recipes pinned. Told you I’m sweet potato crazy! Maybe I’ll pin 40 more and make a different sweet potato recipe everyday next year. That may cure my sweet potato obsession! Note: Gruyère cheese is a little on the expensive side- but it is so worth it. I really don’t think there is a less expensive cheese that comes close to matching its flavor. I used a refrigerated pie crust, but you could definitely make a homemade piecrust. Oh! And I almost forgot! This new, blue tart pan (see the second picture) that I got with a removable bottom worked really great. The quiche just popped out in one giant piece. It was only about $10 at Target and it came in a bunch of different colors. Definitely a good buy. 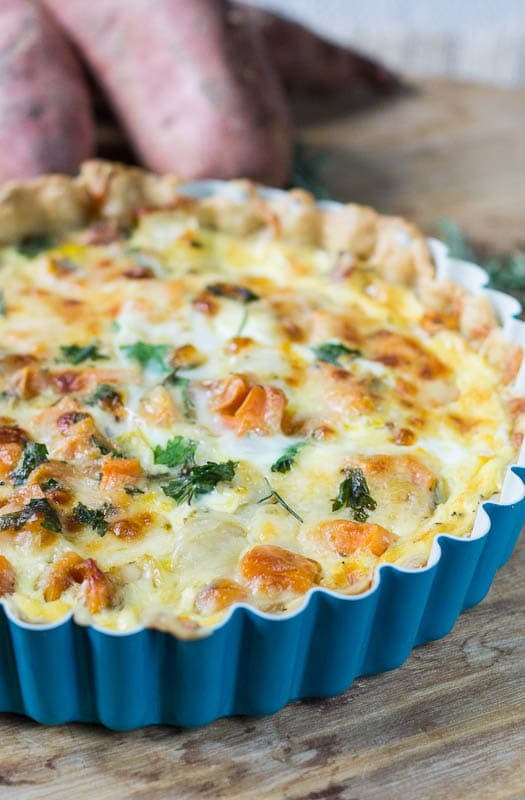 A delicious twist on a traditional quiche with roasted sweet potatoes, onions, and lots of gruyere cheese. In a medium bowl, toss together sweet potatoes, onion, olive oil, seasoned pepper and 1/4 teaspoon salt. Spread in a single layer on a lightly greased jelly roll pan. Bake 15 minutes, or until sweet potatoes are just tender. Stir halfway through.They will get softer when the quiche is baking. Remove pie crust from refrigerator and let sit on the counter for 5 minutes. Unroll the piecrust and fit into a pie plate or deep dish tart pan with removeable bottom. Trim excess pie crust from edges or fold excess and tuck it under. If tart pan has fluted edges, press the pie crust into the edges. Line piecrust with a double layer of heavy duty aluminum foil. You can place pie weights or dried beans on top, but I found that a double thickness of heavy duty foil was enough by itself to keep the pie crust from puffing up while baking. Place on a baking sheet and bake for 10 minutes. Remove foil and bake 5 more minutes. Let crust cool 5-10 minutes. Whisk together half-and-half, eggs, parsley, rosemary, salt and pepper and pour into piecrust. Bake in lower part of oven for 35 to 40 minutes or until set. Cool for 15 minutes before slicing. This entry was posted in General, Main Dishes and tagged bacon, eggs, quiche, sweet potato, sweet potatoes, tart pan. Bookmark the permalink. This was such a delicious quiche!!! The only thing I did differently was replace bacon with goat cheese. Thank you for sharing your recipe . Dont let them get you down on your sweet potato obsession. I made the mistake of going oh their purple flowers are so pretty. Well they are…they also took over half my yard. So now we have 9000 football sized sweet spuds. Appreciate your site it will help me immensely. Can I prebake the pie crust the night before? Thanks! I too used butternut squash but also used the sweet potato. It was amazing. I wasn’t able to put all the egg mixture in but, it still turned out super. Thank you for posting. Best quiche ever! Can leftover quiches be frozen? Sorry Kizzie, I do not have the nutritional facts. Even though I could only fit half the mixture it was still delicious! I also used butternut squash, pancetta and sage instead of the sweet potato/bacon/herbs in your recipe and it came out great. Oh and i used 2% milk instead of half and half and it was still amazing. I love sweet potato but didn’t have any on hand. I will try your suggestion and see how the pie crust does! Thanks for a great recipe! SO happy it turned out well! Butternut squash, pancetta, and sage sounds wonderful! I love the smell of sage this time of year. Nice to know you cut down the calories and it was still delicious. Oh no! That happens to me on occasion too. Next time try folding the excess crust back under so there is a double layer around the edges and press it so that it is really clinging to the top of the pan. Oh girl, move in with me and you will NEVER hear the words “not sweet potatoes again”! I guarantee I am probably even more obsessed with them than you are, and this quiche? To die for! We could eat sweet potatoes everyday! LOL! Hehe. 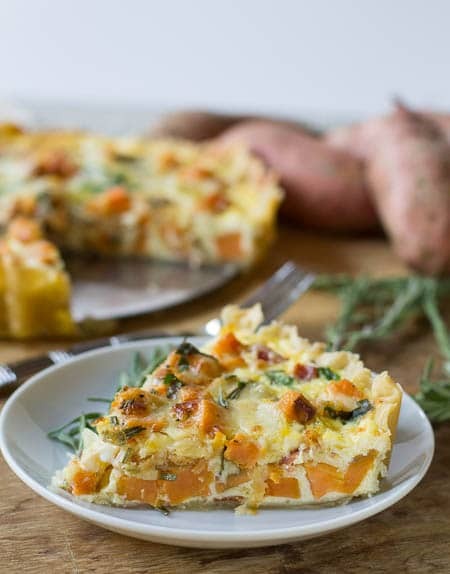 I definitely have food obsessions too 🙂 I would never have thought to add sweet potatoes to a quiche, but it sounds delicious! Oh I absolutely share your sweet potato obsession! I actually like them totally plain like your trainer… funny! This look deliiiiiicious! Christin, what a great Fall recipe! I am pinning this! 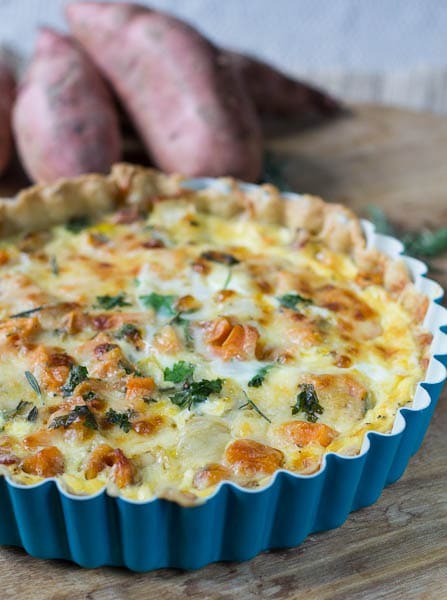 I’d love to make it soon: I love tarts and quiches, I’ve got lots of tart pans, and I L-O-V-E sweet potatoes! Thanks Julia! I need to get more tart pans! They are so much fun. That sounds fantastic Tiffany! Love the way sweet potatoes taste with eggs and I like the yolk a little runny too! That blue tart pan is just TOOOO CUTE!!!! I agree with you, I find it soooo difficult to eat food that tastes kind of…bland! there needs to be flavor somewhere so I can definitely not think of eating a sweet potato or any veggie without something to go with it! And then there’s this lovely quiche! The perfect solution to my problem!!! It’s soooo amazing! I love the browned top!!! Yum! Thanks Samina! I actually picked the blue pan with this recipe in mind. Love blue and orange together! I share your obsession for sweet potatoes — I can’t get enough! I love them in pie, mashed, roasted, you name it. 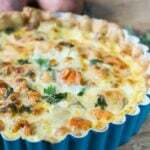 This quiche looks to die for! If this were in front of me, I would eat a giant slice! 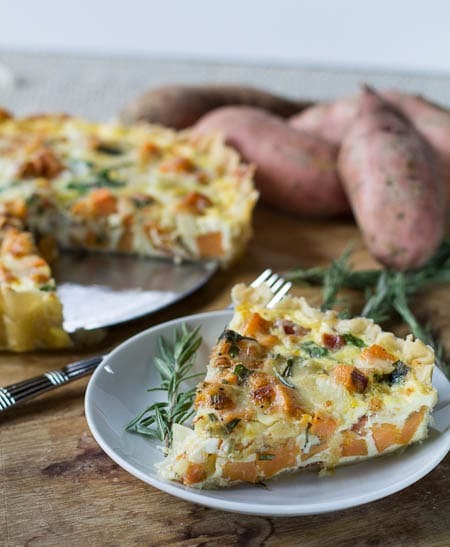 I am a big fan of sweet potatoes too so this quiche looks fabulous! Perfect for a weekend brunch. Love the blue tart pan too! Have a great weekend Christin! Another amazing recipe, Christin! 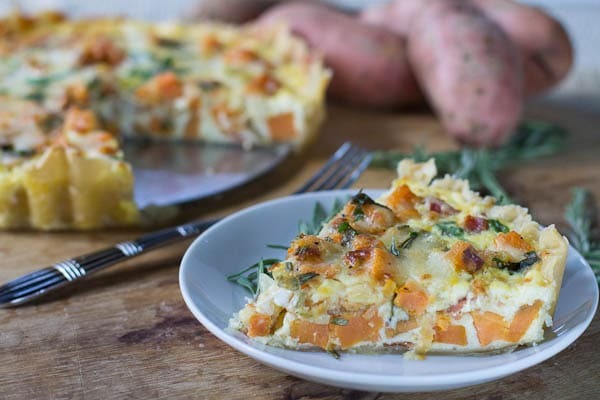 I love sweet potatoe and quiche so this is the perfect combination for a weekend brunch.